Freeform peyote is peyote stitch without a plan or pattern. Basically, you've given yourself the freedom to use peyote stitch with different sizes and shapes of beads. The basic technique is still peyote stitch, but a few new techniques are used to highlight larger beads. If you are choosing materials for your first freeform peyote stitch project, you might want to limit the number of colors you use. For this project, we have chosen a palette of greens with a little bit of earthy-luster beads and some metallic bronze beads to add a little contrast. When selecting the size beads, we chose two colors of size 11/0, three colors of size 8/0, and a size 11/0 hex cut bead. We kept our accent beads small for this project. We chose an assortment of green luster India lampwork beads, some greenish-gold freshwater pearls, and some earth-toned luster India lampwork beads. We are using moss green Wildfire beading thread for this project, as it is less likely to be frayed or cut by the rough edges of the India lampwork beads. 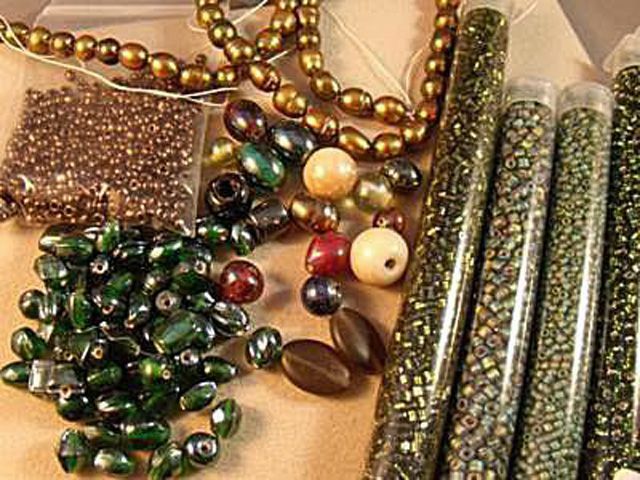 If you are using a nylon beading thread such as Nymo with India lampwork beads, make sure that you smooth any rough edges using a nail file or a bead reamer. You can do freeform peyote using flat even count peyote stitch or flat odd count peyote stitch. You can also do freeform peyote using two or three drop flat peyote. One of the most important technique is learning to add a bridge around beads. This allows you to work around the larger beads in your design but still keep them securely attached. To add a row of seed beads around an accent bead, pick up a number of seed beads that will allow itself to wrap comfortably around one side of the accent bead. To attach the bridge, put your needle through the next bead after the accent bead to continue stitching in peyote. The bridge may initially be loose but will firm up when you continue to add peyote rows attached to the bridge. The first two rows of freeform peyote will determine the length of your project. Start with a comfortable length of thread, typically no longer than five feet and string a stop bead. To make a bracelet like mine, pick up about seven inches of assorted beads. If you want to make a necklace, pick up the number of inches for your final length plus an additional one-half inch. Pick up an assortment of beads for the first row. Pick up small “blocks” of the same type of beads, like a set of four or five size 8/0 beads, twelve size 11/0 beads, an accent bead, a few size 11/0 hex beads, etc. It makes it a little easier to attach a clasp to the end of the piece if you leave a small section of all the same type of bead on either end. We recommend that you don’t use too many accent beads near the ends of the work. Once you get to the end of the strand of beads, pick up the number of beads that you need to continue in peyote stitch (either one, two or three beads), skip the appropriate number of beads, and stitch one peyote stitch. Continue to stitch along the length of your strand of beads, adding bridges around the accent beads as desired. You can also choose to pass through the accent beads on this row and then add bridges around them on the following rows. When you come to the end of the row, pick up the appropriate number of beads and make your turn. You can remove the stop bead at this point. Continue to stitch in this manner, adding new accent beads and stitching around the accent beads picked up in the first row. If you want to break up the “pattern” established in the first few rows, try substituting different size beads throughout the beadwork. For example, instead of picking up one size 8/0 bead, pick up two size 11/0 beads to fit in a space. Keep in mind that if you pick up more beads that will fit comfortably into any given stitch, your beadwork will start to expand. If you pick up fewer beads that will fit comfortably, your beadwork will start to shrink. This is not necessarily less desirable; it all depends on the look you are trying to create with the freeform techniques. When you feel that your beadwork looks satisfactory, you can add some new bridges to the center of the beadwork if desired, or add some surface embellishments such as ruffles, picots, and fringes. When you feel that the beadwork is completely finished, knot your thread, weave it into the beadwork, and clip. A button and loop closure is the simplest way to end your freeform beadwork, but you can also stitch on a traditional toggle, lobster claw or tab clasp. To create a button and loop closure, add a new thread on one side of the beadwork. Coming out of a bead near the center of the edge, pick up a seed bead, a button or bead, and another seed bead. Skip the last seed bead and pass needle and thread back through the button or bead and the first seed bead. Weave into the beadwork and back through the button if desired. Finally, weave needle and thread into the beadwork, knot, weave the end in a bit more, and trim close to the beadwork. On the opposite side of the beadwork, add a new thread. Weave until you are coming out of a bead near the center of the edge. Pick up the number of beads needed to create a loop that will fit comfortably around the bead or button. Remember: if you pick up too many beads, the loop will be too large and will fall off the button without holding it securely; if you pick up too few beads, the loop will not fit around the bead or button at all. Weave your thread back into the beadwork, and then out of the bead where you originally exited. Weave your thread through the loop two or three times to strengthen it. Finally, weave needle and thread into the beadwork, knot, weave in for a bit more, and trim close to the beadwork. Have fun experimenting with freeform beadwork! As you feel more confident, you can add larger focal and accent beads and expand on your range of colors. Freeform beadwork is great fun because you never know what the final piece will look like until it is finished.